The legend of Orson Welles holds that he knew little or nothing about the cinema before making Citizen Kane in 1941. And Welles nurtured this legend, attributing its innovations “to my ignorance. If this word seems inadequate to you, replace it with innocence.” (1) But his little-known first film, The Hearts of Age, made seven years earlier, gives the lie to the legend. While indisputably technically crude and a bit sophomoric, The Hearts of Age reveals both a keen eye for composition and montage, and substantial familiarity with film art. In the summer of 1934, nineteen-year-old Orson Welles returned to the Todd School in Woodstock, Illinois, three years after graduating from its high school (2). In the interim, he had spurned a scholarship to Harvard University, visited Ireland on a sketching tour only to talk his way into performing for the Dublin Gate Theatre, written detective stories for pulp magazines, and travelled through London, Paris, the Ivory Coast, Morocco and Seville, where he spent an afternoon as a professional bullfighter (3). After returning to America in 1933, introductions to Thornton Wilder and Alexander Wolcott led to a position in Katherine Cornell’s touring repertory company. Welles toured with the Cornell company from November 1933 to June 1934, appearing in three plays and making his New York debut as Tybalt in Romeo and Juliet. When the tour ended in the summer of 1934, Welles sponsored a theatre festival at the Todd School. While there, he and William Vance, a high school friend, made The Hearts of Age (4). Roger Hill, the principal of the Todd School provided a 16mm camera (5). Presumably it was an amateur model, as Vance and Welles shot the film at the silent speed of 18 fps commonly used for home movies, rather than the industry standard of 24 fps. Vance produced the film, which he and Welles co-directed (6). Their set was an old Woodstock farmhouse that belonged to the Welles family. Handwritten title-cards (7) introduce the stars: Welles and his then-girlfriend Virginia Nicholson, a Chicago socialite he married in November 1934 (8). Vance also makes a brief appearance, as do Edgerton Paul and Blackie O’Neal, members of the Todd Repertory Company (9). The film begins with a rapid-fire montage sequence of a ringing bell, shot at odd angles and shown in both positive and negative. The “story”, such as it is, begins with Nicholson, liberally made up as an old hag, riding the bell like a hobby-horse. A clown in blackface and top hat appears, pulling on the bell rope, then images of gravestones and crosses. Nicholson struggles with an umbrella, and the montage continues. Then Welles appears at the head of an outdoor staircase, corpulent and leering, made up like a cadaver with a wispy baldhead, cane, and top hat. Over and over he walks down the stairs, Nicholson looking on apprehensively. After another flurry of montage, Welles pantomimes suicide, choking himself with the crook of his cane, followed by footage of the man in blackface hanging in a noose. The film then cuts to indoors, with Welles ostentatiously playing the piano. After hitting a sour note, he opens up the lid and discovers Nicholson, as if in a coffin. Welles then pulls tombstone-shaped cards out of the piano bench: “Sleeping”, “At Rest”, “In Peace”, “With the Lord”, and “The End”. He settles on the last and the film does just that. In any case, Welles’ own recollection of The Hearts of Age is rather suspect. As a parody of Cocteau, it’s an abject failure, as it hardly resembles the antiseptic languor of The Blood of a Poet. 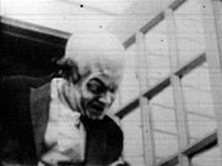 But its ghoulish make-up, mechanical acting, off-kilter compositions and frantic montage quite successfully parody German Expressionism, notably Robert Wiene’s The Cabinet of Dr. Caligari (1919). Additionally, the structure of the montage sequences recalls Eisenstein’s The Battleship Potemkin (1925), repeating actions and fracturing motions. Apparently, William Vance kept the original of The Hearts of Age, as it was eventually donated to the Greenwich Public Library (Connecticut) as a part of the Vance Collection (12). Joseph McBride rediscovered the film in the late 1960s, and the American Film Institute eventually preserved it and deposited a print in The Library of Congress (13). Orson Welles, quoted in Joseph McBride, “Welles Before Kane”, Film Quarterly vol. 23, no. 3, Spring 1970, p. 19. Damien Cummins, Cteq: Annotations on Film vol. 1, no. 1, 1996, available here. McBride, p. 20. Before Vance made The Hearts of Age with Welles, he made a ten-minute adaptation of Dr. Jekyll and Mr. Hyde in 1932. He went on to produce and direct television commercials. Susan King, “Revisiting the Dawn of Avant-Garde Films”, LA Times February 14, 2002 (quoting Bruce Posner). Welles probably made the title-cards, as they appear to be in his handwriting. McBride, p. 20. Welles and Nicholson had one son, Christopher, in 1937, before divorcing in 1940. Orson Welles, L’Avant-scène du cinéma no. 291-292. Jerry Belcher, “Orson Welles, Theatrical Genius, Found Dead at 70”, Los Angeles Times October 11, 1985, p. SD 1.